Automotive electronics control unit (ECU) market to record over USD 95 billion in earnings by 2024, escalating demand for EVs to transform the industry landscape « Global Market Insights, Inc. The automotive electronics control unit (ECU) market has witnessed incredible growth over the last two decades, owing to unparalleled expansion of the global automobile production sector and the influx of technology within vehicles. Continuously evolving knowledge and skills have enabled the integration of advanced electronic elements within automobiles such as fuel injection control and exclusive infotainment systems. Increase in spending power of the general population has encouraged automakers to pioneer connected systems and cutting-edge features, propelling the automotive ECU industry development. As ECUs are programmed to monitor and regulate safety features and vehicle performance, a shifting preference towards safer, more efficient cars will greatly strengthen the automotive ECU market, which boasted of a revenue of more than USD 65 billion in 2017. The International Organization of Motor Vehicle Manufacturers had revealed that a total of 97,302,534 cars and commercial vehicles had been manufactured across the globe in 2017. Practically, the number of ECUs in a car could be anywhere between 70 to more than 150, depending on the type of vehicles, indicating the massive demand that exists for the automotive ECU industry. The large number of ECUs have permitted enhanced safety features and external connectivity solutions to be installed in high-end as well as low-cost vehicles. Commercial vehicles have especially benefitted from the ECU’s ability to regulate the fuel injection system, as increased fuel efficiency plays a vital role in achieving economical goods transportation. Notable advancements in ECUs have stimulated auto manufacturers to find ways for reducing emissions through efficient control systems, ushering in a transformation of the automotive ECU industry and leading to the growth of smart technologies. The advent of electric vehicles has furthered the development of ECUs required for complex monitoring and operating of a vehicle. Considered to be a rapidly expanding source of remuneration for the automotive ECU market, the battery electric vehicles (BEVs or just EVs) are gaining increased momentum with each passing year. Worldwide environmental concerns have been the primary driver for the EV industry, coercing nations to invest heavily into boosting the adoption of EVs. According to the U.S. government, a huge amount of greenhouse gas emissions in the country originates from the transportation sector and in 2016, almost 23% of it was contributed by medium and heavy duty commercial vehicles. As such, not only electric passenger and luxury cars but electric commercial vehicles have also started to attract demand from fleets and major corporations to cut down on their carbon footprint. Tesla, an innovator in the EV industry, has developed all electric Semis for the commercial sector, offering significant power and range to help customers maintain their bottom line while being environment-friendly. Representing a lucrative application scope for the automotive ECU market, the Tesla heavy duty tractor trailers can handle a weight of up to 80,000 pounds at full speed while giving a range of 300 to 500 miles. Tesla has projected that by 2022, it would have received orders for about 100,000 Semis, with companies like UPS, Pepsi, Walmart, DHL and many others having already placed orders for the electric trucks. As other automobile manufacturers join the race for electric heavy duty vehicles, the automotive ECU market will experience considerable upsurge in investments to speed up productions. The International Energy Agency reported that in 2017 itself, the number of electric vehicles on roads had reached 3.1 million. In Europe, there was a 40% rise in the electric car sales in the first half of 2018, signifying that the EV industry is a budding customer base for the automotive ECU market, with growing inclination towards incorporating commercial EVs within fleets. Although electric trucks have been used on the streets for many years now, the increased affordability of the technology has allowed vehicle makers to design and introduce new products. For instance, Piaggio Commercial Vehicles’ electric power range has been providing customers with clean medium-duty commercial vehicles having, comfortable power delivery system and appreciable range, for over 20 years. The automotive ECU industry is thriving due to the efforts of companies who want to bring forward the transition towards a greener transport industry, like Daimler, who is developing 25 ton truck, and Proterra, which has designed an electric public transportation bus. 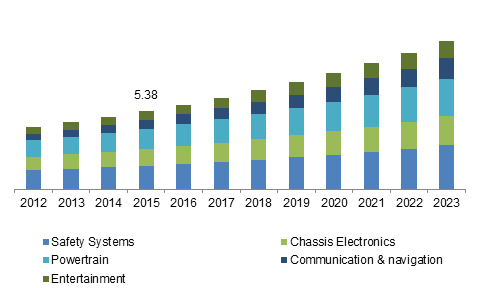 Poised to surpass USD 95 billion in earnings by 2024, the automotive ECU market is dominated by key industry participants like Bosch Group, Delphi Technologies, Hyundai MOBIS, Mitsubishi Electric Corp, Continental AG, besides others. Rising awareness about ADAS and other safety systems to prevent road accidents along with continuous research into designing powerful, more efficient ECUs will give significant propulsion to the automotive ECU industry over the coming years. This entry was posted in Automotive & Transportation and tagged ADAS & Safety, Automotive ECU Manufacturers, Automotive ECU Market Share, Automotive ECU Market Size, Automotive Electronics Control Unit Market, Autonomous Vehicles, BEVs, Body Control & Comfort, Commercial Vehicles, Conventional Vehicles, Hybrid Vehicles, ICE Vehicles, Infotainment & Communication, Passenger Cars, Powertrain, Semi-autonomous Vehicles, Utility Vehicles.